I know I'm posting a day late but it's just been such a crazy week, I'm actually surprised I've managed a post at all! Today I feel like I'm part of the "in crowd" as I'm doing a little Born Pretty Store review. For my review I chose three products: a stamping plate, stamping polish and liquid latex. What a perfect stamping combo eh? All I needed was a stamper and I could have had a Born Pretty set haha! The plate I got was this amazing unicorn stamping plate (item #39130) with lots of different unicorn images. For this mani I started with a base of Danglefoot Polish Cosmic Girl 2.0 and then made decals. The unicorns were stamped with the turquoise stamping polish (item #37600) I got from Born Pretty and coloured in using Danglefoot Polish Prince Charming, Ard As Nails Tantalising Turquoise and Freckles Polish Raspberry Daiquiri. Apparently I forgot to take one of my usual photos for this mani so it'll just have to be the two. The other product I got was some lovely blue liquid latex (item #27296). It arrived at a very good time as I'm almost out of my usual stuff (Sparklea Polish Leatex). The brush makes it very easy to apply around my nail and it dried super quick so I was very happy! There is also the most important thing...the peel! I'm pleased to report this was excellent and very satisfying! It came off in one piece and took the majority of my stamping excess making clean up nice and easy. Of course I couldn't just settle with one mani so I did some more stamping but this time using a different image from the unicorn plate. The base is Barry M Surfboard and obviously I stamped with the Born Pretty polish again. I'm a little bit gutted the stamping didn't show up as well as I'd hoped but it does work as a fab pastel mani. Unicorns and pastels have always been a good match! Overall I absolutely love the stamping plate. There's so many other images I definitely need to use asap and lots of them will also help me practice my decal skills. It's very well etched and I had perfect pick up every time which is amazing considering the low price of the product. The stamping polish obviously also contributes to the perfect pick up so I can't fault that either. I do wish it was a little bit more opaque but maybe I'm just being fussy. We do need light polishes for stamping too right?! Thank you Cynthia for sending me these, I hope you like what I've done with them! For you guys, my lovely followers, I have been given a code for 10% off full price items which is PDW10. I'm super impressed with these items so head to Born Pretty Store and get buying! 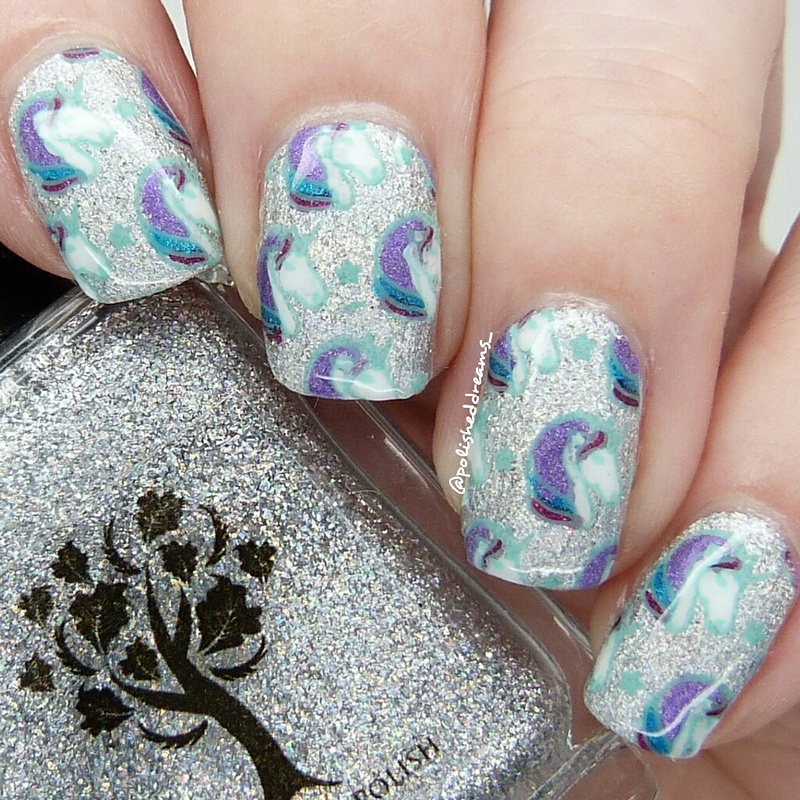 Love your manis, the unicorns may be subtle but they are very pretty. I love the colour combo of the second mani, it's gorgeous.